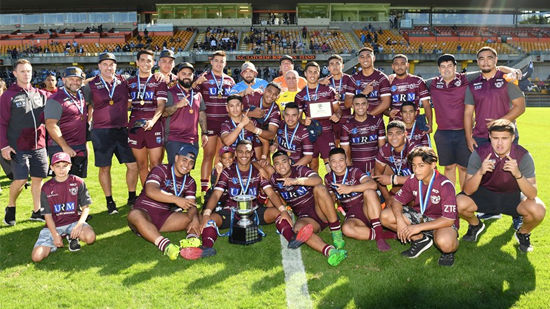 Two late tries have seen the Manly Sea Eagles win their ever Harold Matthews Cup title, defeating the Parramatta Eels 26-18. Manly jumped out to a quick 10-0 lead before Parramatta scored twice to trail by just two points at the break. The Eels then took the lead 18-10 shortly after half time through winger Matthew Komolafe. The Sea Eagles would hit back to cut the lead to two, trailing 18-16 heading into the final five minutes. Then with three minutes to play, Manly centre Uinitoni Mataele finally cracked the Eels’ defence to give his side the lead. Parramatta would go on one more attacking raid but were thwarted when Manly winger Cameron Brown intercepted a pass to score and seal the victory. Eels’ fullback Joshua Tuipulotu, a try scorer in the match who unfortunately left the field through injury, was named Player of the Year after the game. Manly Sea Eagles 26 (Cameron Brown, Gordon Chan Kum Tong, Siosiua Fotu, Tony Francis, Uinitoni Mataele tries; Uluaki Tuipulotu 3 goals) def. Parramatta Eels 18 (Matthew Komolafe, Drew Lloyd, Joshua Tuipulotu tries; Sean Russell 3 goals) at Leichhardt Oval. Click here for full scorers and team lists.